Paris is always a good idea…that’s the mantra, right? It is also one of those classic European cities that you can spend days exploring. From the famed museums like the Louvre to stunning Versailles outside of the city limits, there are countless stops to make and buildings to discover. However, a lot of us don't have time to see every inch of Paris across many days. 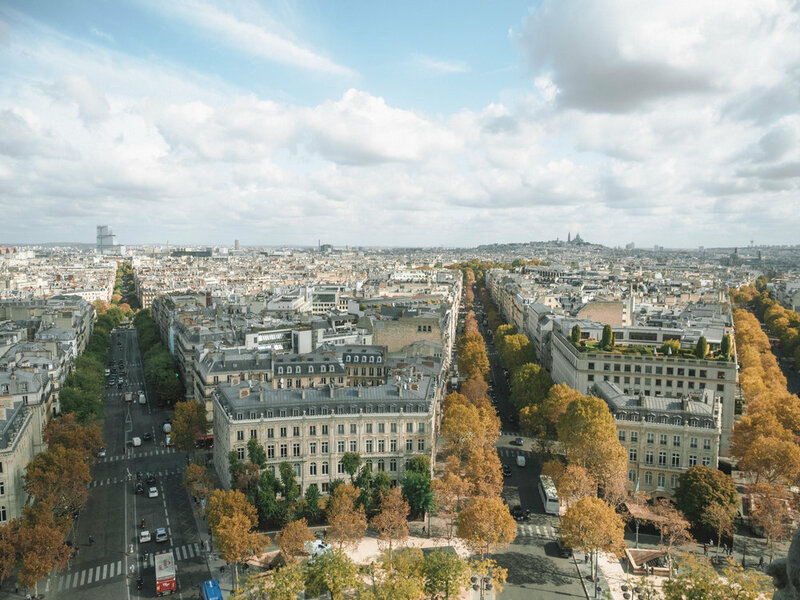 Paris is not only a sightseeing city, it's also a common layover destination which means the time you may have to to experience what Paris has to offer can be very limited. I believe that even with a few short hours, you can make the most of your time in any city if you have a plan and you’re willing to commit to exploring from the early morning to late at night. After visiting Paris twice on short timelines, the most recent being just over 24 hours, I compiled what I believe to be the ultimate guide to hitting all the major spots in Paris in one day. It involves A LOT of walking (close to 12 miles to be exact) but it is split up into smaller sections that are more manageable. Plus, you'll be able to each more baguettes and crepes with those calories you've burned! 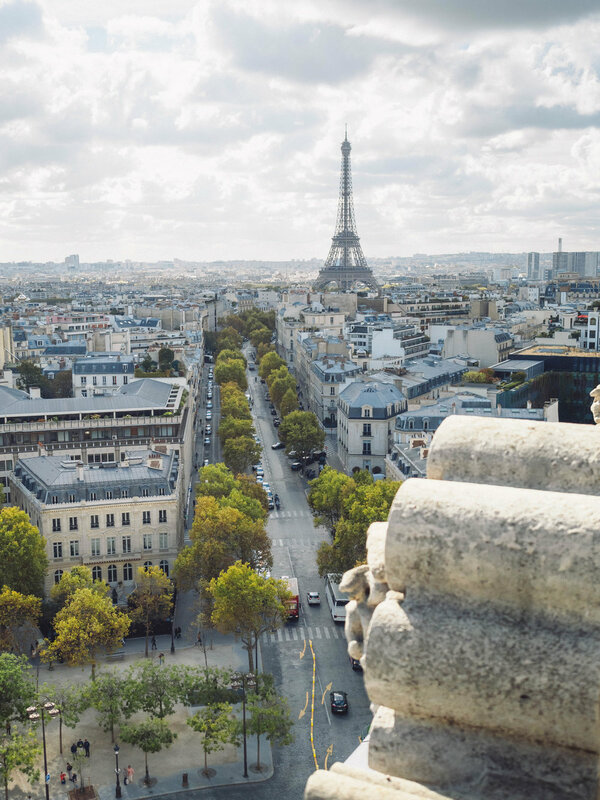 Read ahead for the perfect one day travel itinerary for Paris. The best area to stay when you have limited time in Paris is near the Gare de Nord Train Station. This will give you easy access to both airports quickly and cost efficiently so you can spend less time commuting through the city and more time wandering the streets for fun. We stayed at the adorable Hotel Bienvenue, located a short 15 minute walk from the station. This little boutique hotel was decorated to perfection with floral touches, modern rooms, and a gorgeous outdoor terrace to enjoy a morning coffee or a late night cocktail. I'm a big believer that every person's trip to Paris should begin and end with the Eiffel Tower. It may be one of the most recognizable landmarks in the world but there's something about it that represents all the magic that Paris has to offer as a city. Make your way to the Tower in the early morning by either walking, taking an uber, or riding the train. 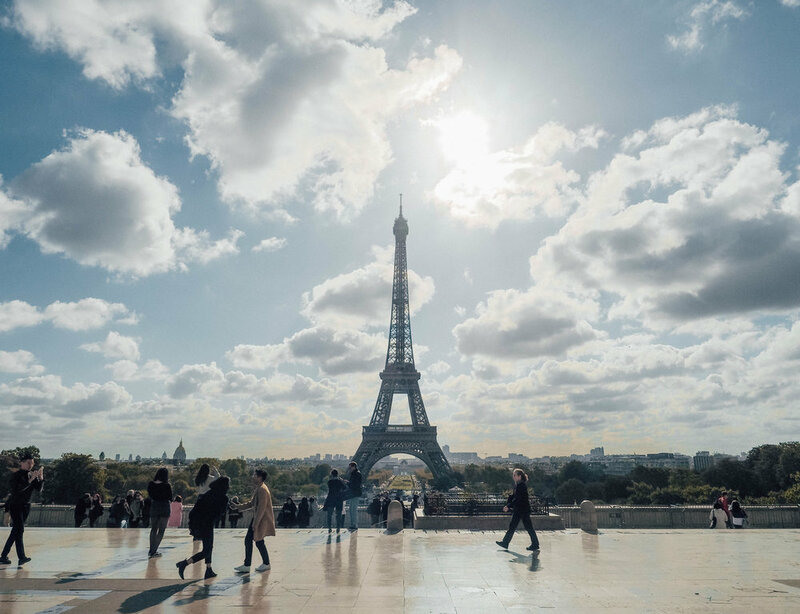 Seeing the Eiffel Tower in the bright morning sun is the perfect start to your day. Walking up to its base (as close as you can since now much of it is blocked off) will really put into perspective how massive the landmark is. Waiting in line to go up the Eiffel Tower is optional but is never something I've attempted. To me, it's not worth the time or money, plus I'll share a great way to see some even better views later in your day. Stop by one of the many nearby crepe stands and grab a quick breakfast. Crepes in France are a staple. And they are good. The last time I was in Paris I basically lived off of Nutella and banana crepes because they’re delicious, filling and cheap. You can also get savory crepes stuffed with ham or cheese instead of sweet ones. However, on my most recent trip, I discovered the simple deliciousness of citron e sucre (lemon juice and sugar) crepes. So wonderful! While almost every tourist will walk right up to the Eiffel Tower, many don't take the time to appreciate it from afar. 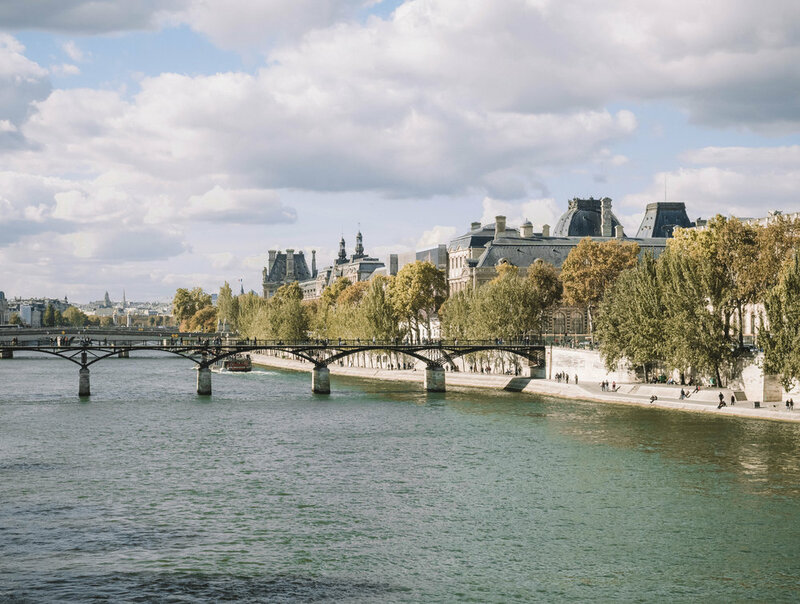 Walk across the river bridge near the Eiffel Tower to the terrace of the Jardins du Trocadéro for beautiful views of the Tower as you overlook brilliant gardens and fountains below. The next stop is the Arc de Triomphe, located in a massive roundabout at the end of the famed Champs-Élysées. The Arc de Triomphe was commissioned by Napoleon and completed in 1836 as a way to honor those who fought in the French Revolutionary and Napoleonic Wars. Take the underground passageway beneath the street and pay 12 euro to go up to the top. Trust me, this is where you'll get your views of Paris (relatively inexpensively and without much of a wait). Be prepared for a bit of a hike up a long spiral staircase to get to the top. We found ourselves huffing and puffing with everyone else around us once we made it, but the 360 view from the rooftop terrace is worth the effort. You can not only see the Eiffel Tower but many of the major landmarks in the city. Twelve different streets merge out from around the Arc, providing endless entertainment as you watch the traffic below made up of trucks, cars, mopeds and bicyclists somehow easily navigate an 8 lane roundabout with no traffic lanes or lights. The Champs-Élysées is one of the most famous throughfares in Europe for its high-end luxury shopping and boutiques. 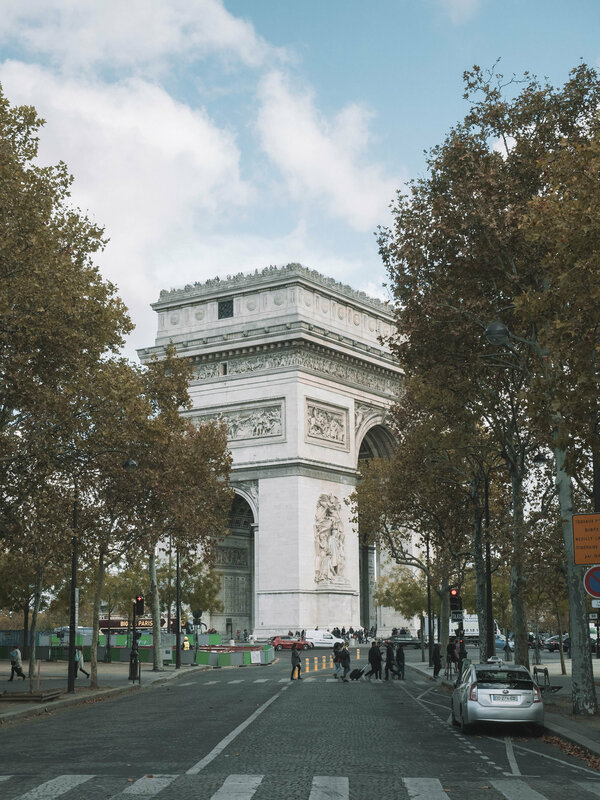 As the major street merging from the Arc de Triomphe, it is easily accessible and provides a great walk filled with people-watching and shopping stops. For car enthusiasts, there are high-tech car showrooms for brands like Peugeot and Renault. For fashion-lovers like me, brands like Louis Vuitton and Longchamp have their flagship locations on the Champs. If you end up crossing the street, make sure you snap a quick shot of the Arc de Triomphe behind you (and watch out for cars)! Continue walking and you eventually hit our next stop, the Concorde. It may not seem like much but once you know the history behind the Place De La Concorde, it much more impressive. The outdoor square is actually more of an octagon with a monument at each point representing a different French city. In the center of the octagon you will find the Luxor Obelisk. Not only is this the oldest monument in Paris, but it’s actually 3,300 years old, brought over from Egypt in 1833! Now that you’ve walked quite a bit, learned some new things and seen some great sights, it’s time to take a breather at the Tuileries Garden. This large and gorgeous garden in the center of France is filled with greenery, tree-lined pathways, fountains and ponds. Throughout the garden you’ll find hundreds of green metal chairs (some even recline) which are an iconic staple of the garden. You can pull one up to any tree or fountain you like and sit back and take in the French culture around you. You’ve finally hit that point in your trip… “To the Louvre!” The Louvre is iconic, and for good reason…it is by far the largest art museum in the world. There’s a famous stat that always boggles my mind: (via tripadvisor) "If you spent 60 seconds looking at each of the objects at the Louvre, going steadily for eight hours a day, it would take you 75 days to see them all.” That’s crazy! And probably not the best way to spend your limited time in Paris, unless you bee-lined straight to the most popular works of art like the statue of Nike, the Venus de Milo, or the Mona Lisa (warning, it’s only 30 inches tall and will be swarmed with people). I’m guilty of doing the quick walk-through of the Louvre in the past but even if you don’t have the time to do that, you can still enjoy the amazing architecture outside! The Louvre is famous for its glass pyramids, known as the Grand Louvre Pyramids, the largest of which serves as the entrance to the museum and the others which are skylights to the lobby below. These pyramids, built by architect I. M. Pei, are the gathering place for tourists trying to get the classic picture of their finger on the tip top of the structure. You will literally see rows and rows of people trying the take this shot, as their photographers friends crouch down to crazy angles and positions to make it perfect. It’s pretty amusing to watch. You can also take in the outside walls of the museums different wings as you make your way around the pyramids. Paris is so amazing, there’s a bustling island smack-dab in the middle of it! The Île de la Cité is one of two islands in Paris located within the River Seine. This island is not only home to some of Paris’s more famous landmarks like the Notre Dame, but it’s also filled with delicious food and fun shops. The best way to access the island is via the Pont Neuf, a spectacular bridge built in 1607. It is the oldest bridge over the Seine in Paris. One of my most favorite stops in Paris which I feel often gets overlooked is the Sainte-Chapelle. It’s located very close to Notre-Dame and looks like nothing special from the outside so people often walk right past it. 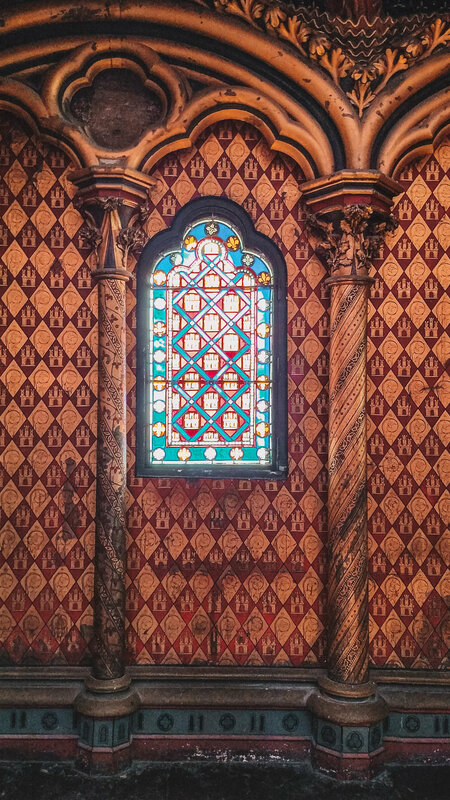 However, the Sainte-Chapelle is one of the most breathtaking buildings in Paris when you see it from within. As you first enter, you are greeted with stunning vaulted ceilings in luxurious colors like deep blues, greens and gold. However the true magic lies in the upper chapel. Once you make your way up the stairs, you’ll be witness to panel after panel of stained glass making up the entirety of the walls. Vivid colors will dance all around you as the sun shines through the glass. 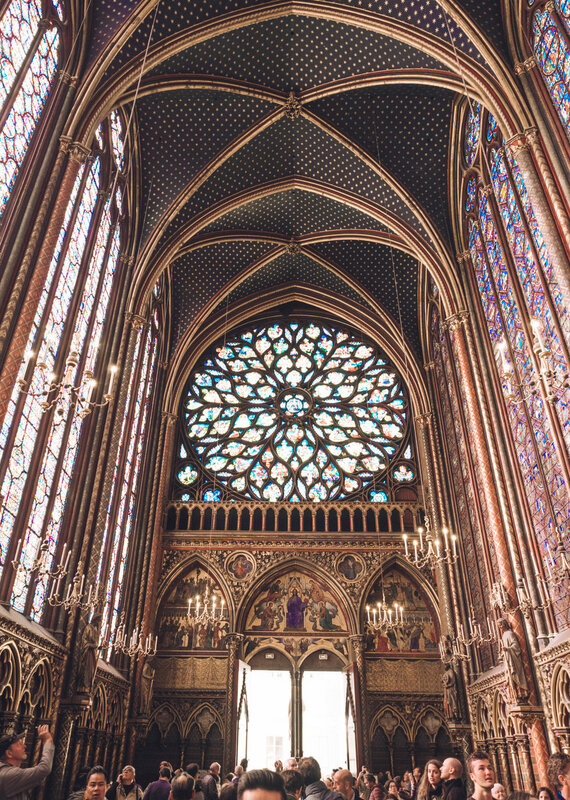 Built in 1248, the Sainte-Chapelle was commissioned by King Louis the IX. The details and patterns throughout will leave you so entranced, you may never want to leave. Another very popular spot in Paris, France is the Cathedral of Notre Dame. This landmark, also located on the Île de la Cité, is the epitome of Gothic architecture. With incredible details and spooky gargoyles, it took over 200 years to build. 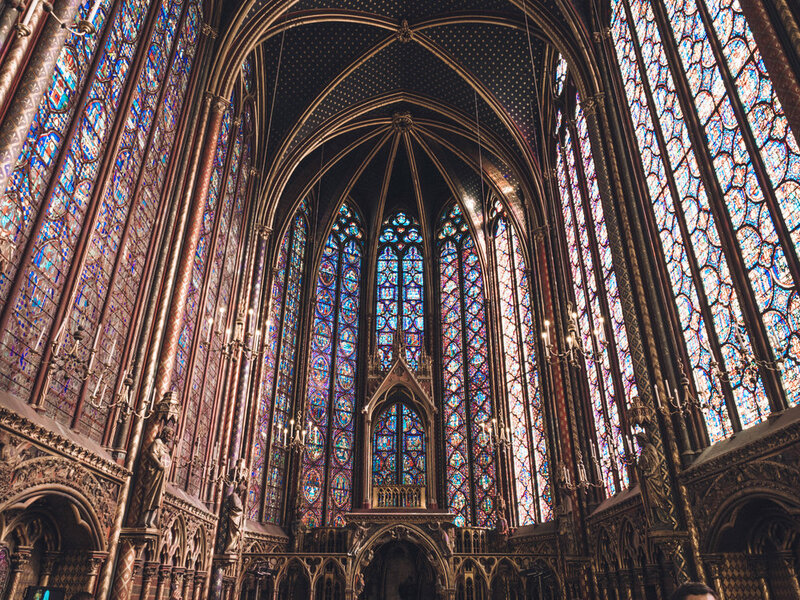 Now it serves as a quintessential stop in Paris, allowing you to explore not only the inside of the church, but go all the way up into the bell towers. So we started our day in Paris, France at the Eiffel Tower and now we’re ending the day there. Why? Because the Eiffel Tower is a completely different experience at night. Every hour, on the hour, for 5 minutes (until about 1 am) the Eiffel Tower sparkles. I mean it REALLY SPARKLES. Lights across the entire height of the tower flicker on and off and a searchlight circles through the sky making the landmark visible from miles away as it glimmers and glows in the night sky. It is amazing. I’ve seen a lot of things in my travels that I’ve had high expectations for that weren’t met. Seeing the Eiffel Tower at night is everything I could have wanted. Normally it lights up a goldish-white, however on my last visit the entire tower was pink for Breast Cancer Awareness month. Make sure you plan ahead to see the Eiffel Tower in the dark before you leave Paris. You won’t regret it. After completing this one day travel itinerary of Paris, not only will you have seen many of the larger points of interest in the city, but your step counter will be thanking you for your hard work. If you have an additional day, I highly recommend you spend time at Versailles, which is just outside the city, to see the lavish residence of King Louis IV and explore the intricate maze of gardens and grounds. Otherwise enjoy your time in Paris, no matter how short, and make sure you eat a lot of great food, drink wine and take in the architecture, even when walking down small streets and alleys. You never know what you’ll stumble upon next!